How Healthy is Your Skin Cancer Immune System? An acidic body chemistry is undesirable because it is a springboard for many diseases including cancer. Acids deplete the enzymes needed by the immune system to fight cancer. Once established, cancer cells inefficiently metabolize food in a way that creates more acid and perpetuates the problem. This makes natural healing unlikely without strategy. This test checks the acidity of saliva upon waking which has been shown to correlate with the acidity levels of other body fluids. An acidic body chemistry can be improved with an alkalizing diet, common antacids, and/or mineral supplements to break the acid-cancer cycle. This test uses a pH test kit for fish aquariums obtainable at pet stores that will cost around $4-$10. Each kit can make about 250 tests so that each test costs a few pennies. The pH (stands for potential hydrogen) scale measures the strength of acids and alkalines on a scale from 0 to 14. A pH reading of 7 is in the middle and is neutral, that is neither acidic nor alkaline. Acids have a pH less than 7, alkalines have a pH greater than 7. This inexpensive test kit is limited to a range of 6.0 - 7.6, but that is sufficient for this purpose. The test kit contains a test tube, indicator solution, two other bottles to adjust the pH of aquariums, and a color chart. Here is how I use the pH test kit. Part I: Measure the pH of drinking water Take a large glass of drinking water and test a sample from it in the test tube using 3 drops of indicator solution. The indicator solution will change the color of the sample in the test tube depending on the acidity or alkalinity of the water. The pH value of the drinking water can be determined by comparing the color of the test sample and the colors in the supplied color chart. If the water is acidic, the pH will be less than 7 and the test sample will be yellow to green. 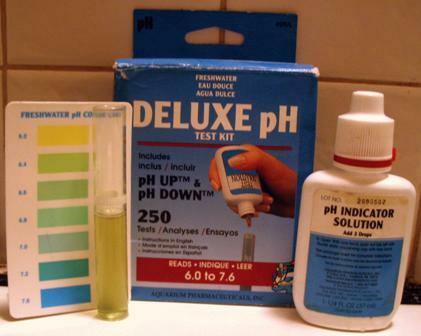 If the water is alkaline, the pH will be greater than 7 and the test sample will be green to blue. The closest match between the color of the sample and colors in the supplied chart reveals the pH of your drinking water. Part II: Obtain a neutral pH=7 water sample If the drinking water test showed yellow, add a drop of alkaline (pH up) from the test kit to the glass of water, stir, and retest a new sample. If the drinking water test showed blue, add a drop of acid (pH down) from the test kit to the glass of water, stir, and retest a new sample. Adjust the water in the glass until a sample tests green. Test result of pH neutral tap water sample. Color approximately matches pH=7.0 on chart. Part III: Add saliva and check for a color change. The following test should be performed just after waking up before eating anything, drinking (even water), or brushing the teeth. The idea is to look at the change in color once a few drops of saliva are added to the green water and indicator solution in the test tube and shaken. If the saliva changes the color of the solution in the test tube from green towards yellow, the saliva is acidic. Similarly, if the saliva changes the color of the solution in the test tube from green towards blue, the saliva is alkaline. If the color is unchanged, the saliva is neutral. Test result of pH neutral tap water sample after acidic saliva added. Color turned towards yellow. This test does not establish the exact pH value of the saliva because it is diluted with water. But the exact pH value of the saliva is probably not essential to know. If the saliva tests acidic (was green, now is more yellow), I think it is more important to move it to a safer (neutral or alkaline) range than to know the exact value. 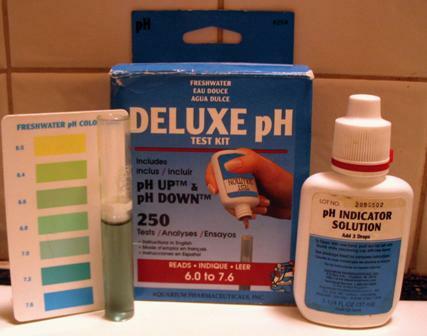 If desired, the pH can be measured fairly accurately within the range of the test kit by starting with a known pH level and seeing if the added saliva changes the color of the test sample. More accurate and wider range test kits and instruments are also available. VWR Scientific (www.vwrsp.com, 800-932-5000) sells inexpensive pH test strips (100 strips for about $15, even cheaper to use if you cut them lengthwise into thinner strips) with a range of 0 to 14. Ask for item EM-9590-1. Simply spit saliva onto the strip and compare the color of the test strip to the supplied color chart. These strips are also useful for testing the pH of cosmetics and soaps. People with cancer typically have wake up saliva pH values of 4 to 5, which is way off the scale for this test kit (yellow). Even a few drops of saliva at that pH level will result in a yellow reading with this test. Healthy people without cancer have saliva pH values averaging 6.5, a value that will change the color away from green much less. I was initially off the scale yellow on this test. I was able to get my pH level back to 7 or higher using lots of Rolaids and an alkalizing diet over a period of a few weeks. I like Rolaids because they are inexpensive, readily available, and supply both calcium and magnesium to help maintain the balance of these two minerals in the body. I now think that highly absorbable mineral supplements are a better way to move the pH. These include coral calcium and calcium citrate products. I like Caltrate Plus with magnesium because it is inexpensive, absorbable, and has a good balance of minerals and vitamin D. Adequate vitamin D can reduce the requirement for minerals to maintain ideal body pH. An alkalizing diet reduces consumption of foods that are high in protein or have high glycemic indexes that causes spikes in blood glucose levels. These include meat, eggs, seafood, nuts except for almonds, rice, beans, bread, grains, cereals, corn, chocolate, sugar, and peas. Most ripe fruit and vegetables are on the good list, with watermelon topping the chart. Foods that supply the minerals calcium, magnesium, and potassium are generally alkalizing. Try to avoid excessive consumption of the mineral iron. Check your multivitamin pill for iron content. An excess of iron can cause insulin resistance, raising blood glucose levels that fuel cancers. Excessive iron can also diminish the capability of the pancreas to produce sodium bicarbonate that provides an alkaline environment for pancreatin enzymes. Another problem with acidic saliva is that it may speed up mercury leakage from silver amalgam fillings. Even low levels of mercury absorbed by the body have a devastating effect on various enzyme systems in the body. Impairing essential enzyme systems can affect immunity from disease. The combination of acidic saliva and amalgam fillings may be a significant part of the steady decline in immune system capability of many diseases. Acidic drinking water, tested in the first step, is a health concern. Most public water supplies are processed to not be acidic to prevent plumbing corrosion, but private supplies are more variable. Although I think filtering drinking water is a good step to eliminate chlorine and pollutants, drinking water that has been filtered results in high risk that it is acidic because alkalizing minerals are also filtered out. Filtering methods include distillers, reverse osmosis systems, and cartridge filters. Consider neutralizing the acid with minerals (coral calcium or Rolaids?) or buying bottled drinking water if yours tests acidic. Incidentally, acidic drinking water has recently been shown to result in a higher risk of diabetes. Natural diabetes control and natural cancer control both depend on a healthy pancreas which is sensitive to excessive acidity. Correcting an acidic body chemistry through diet and mineral supplements can be an important part of healing. Good sources on alkalizing and other types of saliva and urine tests for acidity can be found on the skin cancer resource page. An overview of the causes of skin cancer underlines the pancreatin enzyme defense mechanism that is sensitive to excess acidity. Dozens of practical treatment and prevention strategies include alkalizing steps to take. A discussion of topical skin cancer home remedies also highlights the need to provide an alkalizing environment for pancreatin enzymes in cancer control. © Copyright 2007 Topicalinfo All rights reserved.